Today we took the Stena line ferry from Hook van Holland to Harwich in England. Our day started with the 20km ride to Hook van Holland, along cycle paths the whole way. The Hook van Holland is a small town and we had about an hour there before we had to check in to the ferry. We bought some food for the trip and had a coffee at a local pub. The pub was recommended by the receptionist at the Student Hotel in the Hague, so we had a friendly chat with the barmaid there. The ferry is large, and similar to the NZ Interislander ferries inside. It was also full, probably because of the issues with trucks getting through the channel tunnel at Calais. There were lots of cars and also a few other bicycles. The ferry ride was very long. 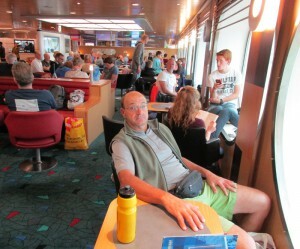 We sat in the harbour for a couple of hours after getting on board and the trip itself was about six hours. There was not much to see once we were out of the harbour. 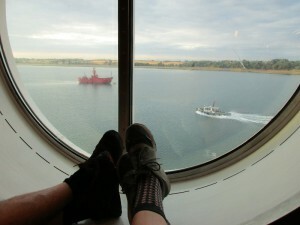 We were lucky to get a seat next to a porthole, with a power plug for the laptops. 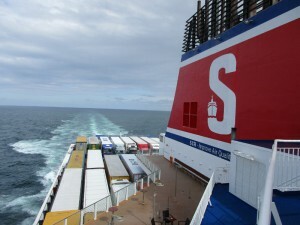 The internet worked while we were in port, but not reliably once we were out at sea. We had a chat with a couple of young German girls, also on bicycles, who were going to volunteer on organic farms in Ireland. They were just out of school and keen to improve their English by spending a few months in Britain. It took ages to get through customs on the other side, it seems that they don’t get New Zealand passports through there very often. We felt sorry for the camper-van in the queue behind us. Our accommodation was in the Captain Fryatt Guesthouse in Harwich, which is above a pub. We had some British ale in the pub in the evening and a chat with some of the locals and a truck driver who had also been on the ferry.